WASHINGTON, June 5, 2013-Agriculture Secretary Tom Vilsack today said that the Federal government must increase collaboration with producers, researchers and industry to develop the next generation of solutions that will help agriculture mitigate and adapt to modern climate challenges. Vilsack noted that under the Obama Administration, the U.S. Department of Agriculture (USDA) has taken a wide variety of proactive steps to prepare for climate challenges projected in the years ahead. This includes the development of Climate Adaptation Plans by USDA agencies to continue delivering quality service in the years and decades to come. Additionally, earlier this year, USDA released two Climate Assessments - one focused on the climate impacts to agriculture in the coming years, and a second focused on U.S. forests. Regional Climate Hubs: USDA will establish seven "Regional Climate Hubs" to work in partnership with producers and foresters. The Secretary called them "Service centers for science-based risk management." Working with other agencies, the hubs will serve as a source of regional data and information for hazard and adaptation planning in the agriculture and forest sectors. The hubs will provide outreach and extension to farmers, ranchers, and forest landowners on science-based risk management and will seek to partner with the land grant universities, Extension, and the private sector. The seven regional hubs will be established for the Northeast, Midwest, Southeast, Northern Plains, Southern Plains, Pacific Northwest, and Southwest. Each hub will be the center of a network of connected activities and services and will be located in a USDA facility within its region. Natural Resources Conservation Service (NRCS) Tools Customized for Producers: NRCS will leverage technology and provide technical assistance to agriculture - both by providing new technical tools for researchers, and new tools for farmers and ranchers themselves. Vilsack announced the release of the "Carbon Management and Evaluation Tool," also known as COMET-FARM, a free online tool that will help producers calculate how much carbon their conservation actions can remove from the atmosphere. Created by USDA's Natural Resources Conservation Service and Colorado State University, in cooperation with USDA's Climate Change Program Office, COMET-FARM will also help producers calculate and understand how land management decisions impact energy use and carbon emissions. COMET-FARM allows producers to input information about their land using a secure online interface - including location, soil characteristics, tillage and nutrient use. The tool then estimates carbon sequestration and greenhouse gas emission reductions associated with conservation practices for cropland, pasture, rangeland, livestock operations and energy. COMET-FARM is applicable to all agricultural lands in the lower 48 states. The tool is available for use at http://www.comet-farm.com/. The Secretary also announced the online release of data collected under the Rapid Carbon Assessment, which will be especially useful for technical experts. This assessment was carried out by NRCS beginning in 2010 to develop statistically reliable quantitative estimates of amounts and distribution of carbon stocks for U.S. soils under various land covers and, to the extent possible, differing agricultural management. Over the course of three years, NRCS collected almost 145,000 samples from 6,000 randomly selected locations. Uniform, Science-Based Cover Crop Guidelines: USDA agencies have worked together to provide new cover cropping guidelines. In the past, some producers have encountered conflicting cover crop management issues when working with multiple USDA agencies. NRCS, Risk Management Agency (RMA) and Farm Service Agency (FSA) worked together this spring to establish common, science-based guidance on when cover crops should be terminated. The agencies engaged stakeholders, partner universities, and the crop insurance industry to figure out how to make cover crop guidelines straightforward and sensible. Secretary Vilsack announced new guidance for USDA Agencies dealing with cover crops, using a new model based on local climate data, tillage management and soil information to account for daily crop growth and use of soil moisture. With this information, experts determined the latest possible time to terminate a cover crop to minimize risk to the cash crop yield. RMA, NRCS and FSA will all uniformly refer producers to these guidelines, and will use them to administer programs. Vilsack noted that the steps being announced today build on previous Obama Administration efforts, including an agreement with the U.S. dairy industry to create anaerobic digesters to create energy and reduce greenhouse gases and pollution, promotion of advanced biofuels development, and projects to increase renewable energy and energy efficiency across rural America. "By taking collaborative, regionally-appropriate steps today to adapt to threats, USDA can help American agriculture continue its tremendous productivity in the years to come," he said. 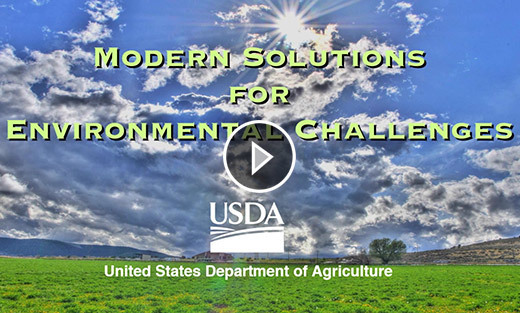 "We've already worked hard to be proactive and ensure that USDA is prepared for modern environmental challenges - but we can't let up in our efforts."